Not content with £160million, fake legal aid investigation scam by rogue lawyers now demands cash from frightened clients. THESE less than profitable times of law firms during the recession are leading to increased levels of fraud by solicitors against their clients in everything from imaginary fee demands to imaginary court cases, as the latest take on LEGAL AID FRAUD reveals some Scottish solicitors are so desperate for money to fund their lifestyles, they are targeting their legal aid clients by claiming they are being investigated by the Scottish Legal Aid Board (SLAB) for fraud and may face arrest & a jail term, but that a cash payment made privately to the solicitor will settle any case against the clients. In several cases brought to the attention of Diary of Injustice where it appears cases are funded by legal aid, including at least one criminal case, the solicitors told their frightened clients their legal aid claims were being investigated by the Scottish Legal Aid Board for irregularities in their declarations of assets & finances and that they may go to prison if caught. Clients were then told a cash payment covering up to in some cases, half of their legal aid claims to-date, would prevent any criminal charges being made by SLAB. Clients are apparently told SLAB would “rather settle the case than take it to court”, but that any settlement “will be taken as an admission of guilt” and the solicitor will have to withdraw from acting on the client’s behalf. One client allegedly on legal aid was told if she repaid £10,000 in cash to her solicitor, “the money would be forwarded to the Scottish Legal Aid Board who indicated they will agree to a no action settlement”. The client did not have the amount demanded by her solicitor who then reduced his demand to £2,000, again insisting on cash payments, which are currently being paid in instalments from the client’s state benefits although those payments will now cease as of publication of this article today. An investigation into the cases brought to the attention of Diary of Injustice has revealed there were never any investigations by the Scottish Legal Aid Board in these cases as it transpires most of the cases (except the criminal case) were never funded by legal aid in the first place and therefore could not be investigated by SLAB for legal aid fraud. Earlier this year in February, the Scottish Legal Aid Board announced increasing numbers of law firms were registering to provide legal aid (pdf), where an increase of 5% in the number of firms registered for civil legal aid (620 to 654), an increase of 3% in the number of solicitors registered for criminal legal aid (1353 to 1392) and an increase of 2% in the number of firms registered for criminal legal aid (562 to 573) took place, noticeably due to the financial downturn. In civil legal aid, the number of applications increased by almost 40% over the past 3 years (22,028 in 2009-2010 and 15,861 in 2007-2008). The current year has seen no diminution of the higher levels of applications. However, as the recession continues, a pattern of rising levels of client fraud by solicitors & law firms across Scotland who are desperate to bring in cash in tough financial times seems to indicate in this latest ploy against clients, the solicitors had set out from the very start to scam their unwitting clients into unrecorded repayments of huge cash sums for non existent civil claims cases which the solicitors claimed had been progressing to or already in a court, and were funded by legal aid. One client of an Edinburgh law firm who was told she stood accused of committing legal aid fraud said she was too scared to contact the Scottish Legal Aid Board to verify if the claims of an investigation into her finances & life were true. She also told Diary of Injustice her solicitor had shown her “photocopied letters” allegedly from the Scottish Legal Aid Board claiming SLAB were investigating her legal aid application and claims made by her solicitor. The client’s solicitor refused to give her copies of the alleged letters from SLAB alleging legal aid fraud, and insisted she deal only through him and not contact the legal aid board directly, claiming she may be arrested if she did. The solicitor told his client if she made a repayment of three thousand pounds in cash to the solicitor, the SLAB investigation and any resulting case against her would be dropped. However, it has been established through sources at the Scottish Court Service, the client’s case, a civil damages claim against her local authority which has allegedly been in the courts for two years, does not exist. The client has now refused to pay any money to her solicitor. One campaigner pointed out the fact clients caught in this latest scam have been told that after they make a cash payment to settle the supposed investigation & accusations of legal aid fraud, that their solicitor will have to withdraw from their case, makes it very convenient for the solicitor who is likely to face no complaint from gullible clients who feel they are lucky to have escaped arrest for a crime which did not occur. Additionally as the payments are requested in cash, there is no record. An official from one of Scotland’s consumer organisations today commented on the situation. A former employee of an Edinburgh law firm who first blew the whistle on this new type of solicitor-client fraud claimed one solicitor from a firm which recently registered to provide legal aid is accused in a complaint of conning four thousand pounds from a client he told was being investigated by SLAB for a fraudulent legal aid claim, when in reality, no investigation existed. The client foolishly handed over the cash to the solicitor, finding it by selling his car. According to the insider, the cash was not entered into the law firm’s accounts. Victims of this very creative fraud are in an uncertain position, because as no legal aid fraud technically took place since the cases were never funded by legal aid in the first place, the Scottish Legal Aid Board can do nothing about it. SLCC & Law Society are not eager to consider legal aid fraud complaints The only recourse for clients conned out of tens of thousands of pounds by solicitors who falsely claim their clients are being investigated for legal aid fraud would be for those affected clients to file a complaint with the Scottish Legal Complaints Commission (SLCC) or the Law Society of Scotland, who are well known for dismissing complaints against the legal profession no matter how serious the offences committed or extent of funds lost. Let’s be honest, neither the SLCC or the Law Society of Scotland are going to want to admit this is occurring within the legal profession, or take any action against it. However, as it appears there are solicitors out there demanding, and receiving large cash payments from their clients which are going undeclared, perhaps HMRC may wish to take a closer look at the Scottish legal profession and how it does business. If readers feel their legal aid funded cases are suffering from unnecessary delays, I recommend you contact Citizens Advice Scotland, Consumer Focus Scotland, the Scottish Legal Aid Board , and of course, please let us here at Diary of Injustice know what has been happening to your case. You can also let other consumers know about these kinds of solicitor scams, via the excellent Consumer Action Group. Personally, I recommend large headlines in newspapers and in the online media regarding named solicitors & law firms who are conning their clients as the only way of getting any action these days on complaints against the unsavoury elements of Scotland's increasingly dishonest legal profession. Court of Session ruling expected on 16 year civil damages claim after 8 weeks of hearings over 2 years. THE COURT OF SESSION is soon expected to issue a ruling in a SIXTEEN YEAR battle for justice in a medical injury case against Motherwell College & North Lanarkshire Council. 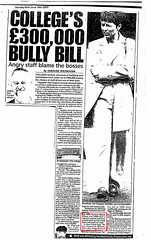 The case, which is the longest of its kind on record, regarding a workplace injury which occurred in 1995, has taken a staggering sixteen years out of the life of Mr Martin Wilson, a Music Lecturer who suffered severe back injuries after help was denied to him in the course of his duties by its now former Principal Richard Millham, who was dubbed a “Bully Boss” by national newspapers after Motherwell College lost a string of unfair dismissal claims brought by College staff. Members of staff at Motherwell College were reported to have described ‘a strong climate of fear which is still there’. One of several unanimous decisions by Employment Tribunals against the College confirmed that Mr Wilson was unfairly dismissed while on long term sickness leave. Lord Woolman is the presiding judge in the present claim of M.Wilson v North Lanarkshire Council & Others (A1628/01). Investigations conducted by the media have revealed the case has generated thousands of pages of transcripts along with numerous hearings before the Court of Session where internationally acclaimed expert medical witnesses from the UK and abroad disputed the testimony of Motherwell College’s own ‘experts’. As the hearings ‘progressed’, many legal observers to the case indicated matters could & should have been resolved years ago, some expressing opinions the case appeared to have been prolonged by legal teams solely for the purpose of generating legal fees from Motherwell College totalling HUNDREDS OF THOUSANDS OF POUNDS, ultimately paid for by taxpayers. An in-depth investigation into the case carried out by Scottish Law Reporter, compiled with the help of observers to the legal proceedings and senior legal insiders, berated Motherwell College and its legal representatives for wilfully delaying for THIRTEEN YEARS after Mr Wilson’s injury before commissioning an expert ergonomics report in this manual handling claim, and then only after Mr Wilson had managed to gain access to the defenders premises, something no fewer than FOUR 'normally reliable' law firms which included the well known Edinburgh law firm of Balfour & Manson & the Glasgow based Harper Macleod who had previously 'represented Mr Wilson’s best interests' had failed to do during the thirteen years since the summons was served on Motherwell College. Damning evidence from interviews with legal observers to the proceedings revealed instances where despite the court suggesting the defenders make the “expert ergonomics report” available to Mr Wilson as soon as possible, the legal agents acting for Motherwell College, Simpson and Marwick, withheld the report until approximately 72 hours before the Proof was scheduled to begin in June of 2008, and then only handing it over on Court premises during a procedural hearing before Lord Penrose. After being told of the report being withheld from the pursuer, Lord Penrose claimed that the defenders had been “playing fast and loose with due process in an attempt to gain an unfair advantage” and “had rendered the scheduled proof hearing unsafe”. Lord Penrose then invited Motherwell College representatives to apply for a postponement, which they did, and despite the party litigant being prepared to continue regardless - he had paid for distinguished expert witnesses to travel from destinations as far afield as the Western United States. Taking the defenders legal representatives conduct into account, Lord Penrose described the situation as 'unfortunate' yet amazingly, no penalty was imposed on the defenders and these tactics, widely viewed as cynical delaying tactics, led to a further delay of over a year, the hearings finally getting started in November 2009 at the Court of Session under Lord Woolman. Later that month, and only after the Proof hearings had begun, a ruling in the Wilson v North Lanarkshire Council & others case heralded in the appearance of Scotland’s first Civil Law McKenzie Friend in a Court of Session case. According to legal observers, hearings in the case continued “sporadically” and one year later in November 2010 Motherwell College’s legal team told the court they were withdrawing their “expert ergonomics report” and would not be relying on it,.leading many observers to view the defender’s case as being “unsustainable”. The report by Scottish Law Reporter also revealed that out of a total of some SIXTEEN LAY WITNESSES to be called by Motherwell College, only FOUR eventually appeared, and none of those included the key player in Mr Wilson’s earlier successful Employment Tribunal Decision against the College, it’s disgraced former Principal, Richard Millham. Astonishingly the defenders suddenly decided at the last minute in January 2011 not to call the College's former Health and Safety Officer in a manual handling claim, - a consequence perhaps of the defenders failure to produce a single risk assessment or manual handling record. Observers to hearings of the case described the testimony of Motherwell College’s expert witnesses as “lacking any credibility whatsoever”, “highly scripted”, and “unusually combative”. North Lanarkshire Council & Motherwell College were represented throughout hearings at the Court of Session by Edinburgh law firm Simpson & Marwick. Senior Counsel for Simpson & Marwick was Ian MacKay QC, Junior Counsel was Calum Wilson both of Compass Chambers. Political connections ? 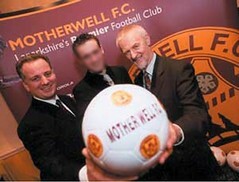 Former Motherwell College Principal Richard Millham, pictured (left) with the then First Minister Jack McConnell (right) in Motherwell FC awards ceremony. While the Court of Session is expected to issue its ruling soon, there remain significant questions over who or what delayed a civil damages claim for approximately 16 years against scandal hit Motherwell College. Senior legal insiders have indicated the case may well form part of an effort to have the Scottish Parliament look at the regular and unjustifiable delays in access to justice in the Scottish courts while some have raised questions over the possibility influence of a political nature may have been exerted on law firms to delay Mr Wilson’s access to justice. Motherwell College squandered £300K of taxpayers money fighting a string of Tribunal hearings involving bullying allegations against lecturers which the College lost. A number of media reports, referred to in earlier coverage by Scottish Law Reporter, show Motherwell College were involved in a string of Employment Tribunal decisions the college lost during Richard Millham’s term as Principal of Motherwell College. Allegations in newspapers including the Sunday Mail reported that “In 1999, lecturer Martin Wilson won £4000 after a tribunal ruled he had been unfairly fired. He had a back injury and could not work. A close friend said : "He was targeted by Millham. There was a strong climate of fear, which is still there ." Holyrood Justice Committee Convener Christine Grahame wants explanations from Lord Advocate, Police over failures in Simon San murder case. FOR ONCE in its long history of appearing to operate without any oversight, the Crown Office & Lord Advocate may not escape so easily with the usual excuses in a murder case so appallingly handled it generated an apology from the Police Force which investigated it as CHRISTINE GRAHAME msp, the Convener of the Scottish Parliament’s Justice Committee tells BBC News there may be room for an independent public inquiry into the authorities handling of the investigation & prosecution of the racially motivated murder in August last year of Simon San. Christine Grahame spoke to BBC News, saying a "full explanation" was needed from the Lord Advocate, who had said in a statement the media were told was ‘attributed to a spokesperson’ on Tuesday that an inquiry would not be held by the Crown Office. Ms Grahame told BBC Scotland: "I think we need full explanations from the constabularies about what their processes are following on from this case and we need a full explanation from the Lord Advocate.Once these are in the public domain then we can see where we go from there. If these explanations are not satisfactory then there might be room indeed for an independent inquiry." Simon San, murdered in a racist attack by thugs in Edinburgh. The Daily Record newspaper reported on the failures by Police & the Crown Office in the murder of Mr San, saying : Simon, a shy, gentle man who hated violence, was ambushed outside his family's Yong Hua Garden takeaway in Lochend, Edinburgh, in August last year. A pack of feral youths surrounded his Smart car and began rocking it back and forth. Simon phoned police and got out of the car. Witnesses saw the gang force Simon back towards a wall. Reid then punched him in the face while he was on the phone. Simon hit his head on the pavement and suffered fatal brain injuries. The scum went through his pockets and stole his car keys and phone as he lay dying. Locals then heard the neds calling their victim a "Chinky". Simon's family told the cops he was a victim of racial hatred but their warnings fell on deaf ears. Instead, the police focused on the idea that Simon was the victim of a robbery gone wrong - a theory the force's own report into the failed investigation calls "misguided". The report says "little emphasis" was placed on the gang's racist language. The "interview strategy" for the four accused included "a number of questions relating to robbery, but none regarding any racist element or language". The cops also failed to properly look at possible racial incidents in the gang's records. Police papers said one was "racially prejudiced" and had previously been reported for a racist offence. The prosecution of those involved in the death of Mr San earlier this year saw the conviction of a 16 year old youth, John Reid, who admitted the culpable homicide of Mr San and was sentenced to five years for the killing. Two other 16-year-olds pleaded guilty to assault charges in connection with the case, however in April, Michael Roberts, had his original 42-month sentence cut to 26 months and Keir Rodger had his 34-month term cut to 24 months by appeal judges. A 14-year-old, who cannot be identified, who also faced an assault charge in connection with the death of Mr San, had his not guilty plea accepted by the Crown but admitted breaching bail conditions. Deputy Chief Constable Steve Allen’s apology to the family of Simon San was reported throughout the media in which the Capital’s Police Force admitted failures to treat the murder of Mr San as a racially motivated incident. Lothian & Borders Police Deputy Chief Constable Steve Allen said: "There is no doubt that Simon's family have not had the service from my force that we would hope to give any family or any victim of crime. I have apologised privately to the family for that failure and would like to repeat that apology publicly." Lord Advocate Frank Mulholland – ‘will not be instructing an inquiry’. However, in stark contrast to the apology from the Police and demands for an inquiry from the victim’s family, the Crown Office in what many will see as a now typical reaction to the call for an investigation by the Lord Advocate, issued a blunt statement denying there was any evidence to treat the case as racially motivated or that an inquiry was needed. A spokesperson for the Crown Office adding to their original statement : "We can confirm the Lord Advocate will not be instructing an inquiry and is satisfied with the Crown's prosecution of the case. Mr John Logue, the Area Procurator Fiscal for Lothian & Borders, has offered to meet with Mr San's family to discuss any questions which they might now have." There has been no reaction today from the Crown Office to Ms Grahame’s welcome comments on the matter, however clearly in the interests of justice, there must be a full inquiry into the murder of Simon San to establish how the authorities have let down his family, the justice system, and Scotland. Racist murders in the East, Sectarian letter bombs & deaths in the West : Are Scotland’s Crown Office & Police institutionally out of touch ? Does the Crown Office have the will to investigate racist or sectarian crimes in Scotland? IN a country where the authorities appear to avoid investigating murders as racially, or even religiously provoked at all costs, and where members of religious or racial minorities are, according to academics, statistically more likely to be jailed by an apparently prejudiced justice system, it comes as no surprise that over a decade after the racially motivated murder of Surjit Singh Chhokar, there are now new calls for an inquiry into how the Crown Office and now, Lothian & Borders Police, avoided investigating the murder of a Chinese man from Edinburgh, Simon San in August 2010 as a racially motivated crime. In a statement released by Lothian & Borders Police, the Deputy Chief Constable Steve Allen has apologised to the family of Mr San for not investigating the murder as a racist incident. Simon San was attacked whilst at work in the Lochend area of Edinburgh in August 2010. He suffered injuries from which he died and Lothian and Borders Police launched a murder inquiry. Four young men were quickly identified and subsequently appeared in court. According to the statement released by Lothian & Borders Police, Mr San's family made a number of complaints about the police response and an internal investigation was undertaken. This investigation, which was known as Operation Waymark, is now completed. The San family has been involved throughout and the report has been discussed with them. Mr Allen also apologised on behalf of the organisation for not listening to the family when they said they thought the attack was racially motivated; for not making them feel that their views mattered, and for not recording and investigating the attack on Simon as a racist incident. He added: "We said that Simon was in the wrong place at the wrong time. He was not. Simon was at his place of work in a city that was his home. He was playing his part as an active member of our community, contributing through work to the economic success of this city. Simon was a fellow citizen who was killed tragically and pointlessly." The force is committed to learning from Operation Waymark and is now more alert to the needs and perception of family members. It has already taken steps to review its management of critical incidents and is refreshing guidance and training given to all officers and police staff in relation to identifying when a hate crime has occurred. The DCC has also spoken individually to all officers and police staff mentioned in the complaint. Mr San's family have been supported all along by Edinburgh and Lothians Regional Equality Council. ELREC's chairman, Mr Foysol Choudhury, said: "We commend the family for their courage and perseverance to ensure the mishandling of Simon's murder investigation is made public and other families who experience a similar event will not have their suffering prolonged. We also want to thank the enquiry team for their effort in delivering the answers the family had been seeking." The Crown Office released the following statement in response to the apology to the San family from Lothian & Borders Police over their failures in the murder of Mr San. The statement from the Crown Office denies there was any evidence in law to show to show that the attack on Mr San was racially motivated , however as yet the statement does not appear on the Crown Office website. The statement, from a Crown Office spokesperson said : Lothian and Borders police have today apologised for mistakes they have made in this case. In light of this apology the Area Procurator Fiscal has offered to meet Mr San’s family again to discuss any questions which they might now have. The Crown was alert to the question of racial motivation from the beginning of the investigation and raised the issue with the police at an early stage. After careful consideration of all the available evidence provided to the Crown by the police, Crown Counsel concluded that there was no evidence to show that the attack on Mr San was racially motivated. For a racial aggravation to be proved there must be evidence to demonstrate the motivation for the commission of the crime. There was no evidence in law to support this and this remains the case. There was evidence of a racial term used by the accused sometime after the crime but this was not evidence of motivation for the crime. Notwithstanding this the Advocate Depute advised the High Court when John Reid pled guilty to culpable homicide in October 2010 that it was the strongly held view of Mr San's family that the offence was racially motivated. In addition a victim impact statement was provided to the court which conveyed the family’s views on the motivation for the crime. The Solicitor representing the family thanked the Advocate Depute prior to the accused pleading guilty for the sensitive way in which the family had been treated and the way the case was presented. There are now, unsurprisingly, questions being raised why the Crown Office failed to prosecute the murder of Mr San as a racially motivated crime and there are now calls for an inquiry into the way the Crown Office handled the case. However, the Crown Office have refused calls for an inquiry into why the incident was not investigated as a racially motivated murder. A spokesperson for the Crown Office said : "We can confirm the Lord Advocate will not be instructing an inquiry and is satisfied with the Crown's prosecution of the case. Mr John Logue, the Area Procurator Fiscal for Lothian & Borders, has offered to meet with Mr San's family to discuss any questions which they might now have." Last night on BBC Newsnight Scotland, the Deputy Chief Constable of Lothian & Borders Police Mr Allen was interviewed on his force’s investigation of the case, however Crown Office officials apparently refused to take part in the programme, or at least “were unavailable”, as is now the recognised code for nothing further to add. The overall impression is that any lessons supposedly learned from the recommendations from the ‘independent inquiries’ carried out by Advocate Raj Jandoo of the Crown Office’s failure to prosecute the 1998 murder of Surjit Singh Chhokar as a racist crime, have after all these years, not had much effect on how racist cases are eventually prosecuted in the justice system. The accusations at the time of Surjit Singh Chhokar’s murder was that the Crown Office and the Scottish justice system was institutionally racist. Today, the same accusations appear to hold sway. In a remarkable twist of fate, the author of the reports into the Chhokar case, Dr Jandoo, may well have been the victim of racism himself, after being convicted in 2005 of an incident involving a "bomb threat" aboard an aircraft flying to the Isle of Lewis. Whilst it is now clear that racist crimes face an uphill battle to be prosecuted in the Scottish justice system, crimes involving sectarianism also appear to suffer the same problems, where a string of murders across Scotland in the past year, regarded widely by many in the communities in which they occurred as having sectarian connotations, have not seen even a hint of the notion being put forward by the authorities who appear to be doing everything they can to avoid any mention of religious divisions in Scotland. Even the Scottish Parliament’s Petitions Committee who were considering a public petition, Petition PE1073 which challenged the Scottish Justice system for incarcerating religious minorities including Catholics at a higher rate than the rest of the population, met in secret to debate whether to even publish research carried out by an academic which backed up the Petition’s claims, such is the apparent fear of acknowledging sectarianism within Scotland and even our justice system. Indeed, the only recent moves to tackle sectarianism by the Scottish authorities have come on the back of conflict between groups of football club supporters & online incidents involving death threats against individuals, after letter bombs were sent out to politicians, football personalities and even a Scottish QC, allegedly motivated by sectarianism & religious hate, issues which most in authority in Scotland appear to be keen to sweep under the carpet. Clearly, there are still attitudes on religious & racist crimes within Scotland’s criminal justice system which are just as “Victorian” as our civil justice system and the impression is left that Scotland’s prosecution services are out of touch with Scottish society and its expectations of justice in the 21st century. Complaints against the legal profession appear to receive more of a hearing in England & Wales than in Scotland. THREE YEARS ON & after the better part of TEN MILLION POUNDS has been squandered on the notoriously anti-consumer Scottish Legal Complaints Commission (SLCC), at least two of those millions coming from taxpayers via the Scottish Government, it may be an uncomfortable fact for some to swallow that complaints against solicitors & law firms in England & Wales are receiving more of a hearing, along with the expectation of enforcement action on case decisions from the Legal Ombudsman (LeO) than is the case in Scotland. The major influence of the Law Society of Scotland on the SLCC’s ‘will’ to genuinely investigate consumer grievances against their solicitors, and the Scottish legal establishment’s almost deadly desire to keep regulating its own is seen as the key element in this now growing disparity between how Scots users of legal services can expect their complaints to be dealt with the SLCC & Law Society of Scotland compared to consumers in England & Wales who now deal with the LeO. Legal Ombudsman for England & Wales, a world away from its poor Scottish relative the SLCC. In what may well be a good indicator of the determination to press ahead with regulation reform of legal services in England & Wales, a first came last week for the Legal Ombudsman’s office which began work in 2010, where Adam Sampson, the Chief Legal Ombudsman for England & Wales announced the LeO had taken legal action against two law firms which had refused to comply with complaints decisions issued by the LeO. The enforcement case was one of two brought for the first time by the Ombudsman under the Legal Services Act 2007. It was only after the action was launched that the firm paid out £2,650 compensation to a client, as the Ombudsman had ordered, plus interest. The client had complained after the firm paid money to a third party without authorisation. A district judge sitting at Birmingham County Court on Monday 15 August ordered the firm to pay the Ombudsman’s costs of bringing the case of £1,215. A second case at the same court was adjourned to allow a different firm to comply with an Ombudsman’s decision.In that case the firm had mismanaged work for a property owner and the Ombudsman had ordered them to pay their client £5,704 compensation. When the firm failed to comply, the Ombudsman issued proceedings for the court’s permission to enforce the decision as if it were a court judgement. The firm initially tried to argue that the decision was defective but, when the Ombudsman produced the relevant legal materials, at the eleventh hour agreed to settle the matter and pay the Ombudsman’s costs of £1,000. The hearing was adjourned for 28 days for this to be done. Legal Ombudsman for England & Wales, Adam Sampson. Commenting on the decision to take legal action against the flaw firms who failed to comply with rulings by the LeO, Adam Sampson, the Chief Legal Ombudsman, said: “These are the first such enforcement proceedings we’ve brought under the Legal Services Act 2007. It’s regrettable that we had to take these steps, and that the firms didn’t act more promptly to bring matters to a close for the complainants. While it may be comforting to note the Legal Ombudsman for England & Wales after only one year in the job is pressing ahead with enforcing complaints decisions and online publication of a raft of information on complaints decisions & statistics which is of considerable value to consumers in England & Wales, it is now unavoidably noticeable that clients of Scottish solicitors have the short end of the stick in pursing complaints against their solicitors, or even access to the level of information now available in England & Wales which, if published in Scotland might lead to clients avoiding using the crop of “usual suspect” Scottish law firms who continuously abuse their clients. As the record currently shows, the now three year old Scottish Legal Complaints Commission, having soaked up nearly ten million pounds from the legal profession & taxpayers, has so far admitted only one solitary complaint as being upheld by their ‘skilled investigations’ and in comparison to the LeO’s court action against law firms, forcing resolutions to client complaints, the situation in Scotland is exactly the reverse with the Scottish Legal Complaints Commission itself now a target of at least fifteen cases in the Court of Session brought by solicitors and the Law Society of Scotland against decisions by the SLCC either to refer cases to the Law Society for further investigation, or for its refusal to investigate third party complaints. With regards to other key expectations of the SLCC, where the power to monitor the notoriously corrupt Master Policy & Guarantee Fund was given to the Scots law complaints quango via the legislation which created it, the Legal Profession & Legal Aid (Scotland) Act 2007, no further advance on the controversial subject has been made by the SLCC who are now reluctant to publish their latest attempts at ‘research’ into financial damages claims against ‘crooked lawyers’, cases & claims which have been deliberately derailed by the Law Society of Scotland and its Master Policy insurers, Marsh UK and those who underwrite the Master Policy such as Royal Sun Alliance PLC & Aviva Insurance. Let’s be clear, I am not saying the Legal Ombudsman for England & Wales is perfect. I am well aware there are a great many people who disagree with decisions the LeO has taken on complaints. However, the sea change in travelling over the border to see how complaints are dealt with and noting the attitudes of those dealing with complaints and the clients who make them, compared with what Scots legal services users can expect by way of an almost constant tone of disrespect from the SLCC, the differences are now clear to see. It is now an unavoidable fact that Scots consumers are taking too great a risk in dealing with Scottish law firms who are poorly regulated by regulators who clearly have no time for, or in a growing number of cases even discriminate against consumers who are forced by circumstances to make complaints about their solicitors. Can Scots lawyers be trusted with £160m of legal aid public funds when client frauds continue to occur ? LAW FIRMS identified in client frauds should not expect to automatically receive public funds from the ONE HUNDRED & SIXTY MILLION POUND taxpayer funded legal aid budget managed by the Scottish Legal Aid Board (SLAB), until solicitors and their regulators publicly prove they are preventing further fraud by beefing up strict supervision over their internal accounting procedures, according to a senior legal insider who branded Scottish lawyers accounts generally as “a dogs breakfast” and in some cases “lacking any credibility in the business world”. Last weekend, the Sunday Mail newspaper reported a significant fraud involving up to £150,000 of client funds from Kilmarnock law firm BELL & COMPANY SOLICITORS. It was further reported the law firm called in the Police after the fraud, which had apparently been going on for some months, had been discovered. A paralegal was identified in connection with the fraud and is reported to have been dismissed from her post. There are as yet no reports of any criminal charges being made in the case. There is no suggestion whatsoever the fraud at Bell & Co Solicitors extends to legal aid payments, and, according to news reports, the law firm did call in the Police as soon as the fraud was discovered, however as the firm is registered with the Scottish Legal Aid Board and regularly receive payments, SLAB was asked if they were concerned about reports in the press of a law firm which receives legal aid public funds had been identified in a substantial client fraud. A senior legal insider, who prefers not to be named, said SLAB should be more pro-active in taking away legal aid payments from law firms who are identified in frauds of any kind until such time as they prove themselves fit to receive public funds. He also backed up claims from others within the profession that solicitors internal audit procedures are a mess. A former employee of an Edinburgh law firm alleged a general culture of dishonesty in audit procedures, particularly on how accounts for services to clients are prepared. It should be noted in the particular case referred to above, the Sheriff ruled in favour of the law firm’s since-discovered-to-be-fabricated evidence which did not help matters and resulted in a protracted time of threats of repossession & bankruptcy against the client concerned. The matter was only resolved when the case was given to a journalist to investigate who discovered one of the two counsels opinions had been faked as the Advocate who it was claimed had given the opinion was ill at the time and not working. Upon being shown the evidence, along with an email from the Advocate who denied giving any opinion in the case, the law firm subsequently ceased its demands for any fees, however there are no reports of any action being taken against the law firm and its legal representatives who clearly lied in court to obtain recovery of fees it was not due. The general perception of Scots law firms failing to keep accurate accounts was coincidentally reflected in sentiments reportedly expressed by the Chief Executive of the Scottish Legal Aid Board (SLAB), Lindsay Montgomery, who was alleged to have said in an allegedly recorded conversation with the Govan Law Centre’s Mike Dailly that solicitors “were useless and unable to count”. The controversial, unverified remarks were made public by Mr Dailly who claimed the SLAB Chief Executive had leaned on the Law Society of Scotland to silence its Access to Justice Committee, which was chaired by Mr Dailly until he & its members resigned in protest after arguments broke out over the Committee’s published proposals to scrap the Scottish Legal Aid Board and merge it with the scandal ridden, anti-client Scottish Legal Complaints Commission. Top Scots QC Paul McBride, who is a Board member of the Scottish Legal Aid Board was reported to have “slammed the proposed changes as "preposterous.” and said further : "SLAB exist to enable access to justice and to make sure legal aid delivers the maximum value for the taxpayer. The board serve a vital role and save the public an enormous amount every year. The idea of putting lawyers in charge of administering money to themselves is preposterous and unworkable. "This is like putting Homer Simpson in charge of a doughnut factory." While debate still rages on whether the SLAB Chief Executive made the remarks or not, I revealed earlier this week some Scottish lawyers most certainly do have the ability to count their own bank accounts, where : In just one of the cases brought to the attention of Diary of Injustice over the past year, an apparently small but well known law firm in the Scottish Borders was found to have dozens of bank accounts where client funds had been lost on a regular basis and worse still, one of the solicitors in the law firm has, according to information seen by Diary of Injustice, 23 different bank accounts in different banks & different names, some using variations of his own name, others allegedly in his family members name with control signed over to him. First Minister Salmond & Justice Secretary MacAskill keeping complaints oversight within the establishment. IT will come as little surprise to anyone that political appointments to positions of oversight of complaints of the judiciary, and complaints against the First Minister himself, attract questions over how the appointments came to be made, along with the types of people who would rush to fill such controversial vacancies. So it is with the weekend announcements of the appointment of an SNP leafleteer, Moi Ali, to the position of Judicial Complaints Reviewer on a recession busting salary of £209 a day, and the appointment of former Lord Advocates Lord Fraser of Carmyllie & Dame Elish Angiolini to the roles of advisers to the Ministerial code, to deal with complaints against the First Minister himself. Let’s be honest now. Does anyone really think a job, paid for by taxpayers at the rate of £209 a day which has the duty of investigating whether complaints against Scottish judges fit in with the Complaints about the Judiciary (Scotland) Rules 2011, will do anything other than agree with the findings or rulings of the Lord President in complaints about members of Scotland’s judiciary ? After all, to suggest the Lord President has not complied with the Judiciary's own rules would surely go against the grain of Judicial Infallibility, a principle which senior members of the judiciary seem to have awarded themselves in all things relating to regulation of their peers. Equally, Does anyone really think the two former Lord Advocates, as controversial as both figures have been, will rule that a complaint against the Ministerial Code might be well founded enough for something other than even the possibility of a slap on some part of the anatomy ? No. If they do, they will break with the fine tradition of their predecessors, Lord Steel & George Reid who closed without action all three complaints made against the First Minister since 2008. Justice Secretary MacAskill appoints SNP leafleteer Moi Ali to ‘powerless’ judicial complaints role, will bent Scottish judges be held to account ? Judicial complaints oversight without powers, the latest window dressing exercise from Kenny MacAskill. Scotland’s Justice Secretary Kenny MacAskill has announced the appointment of Moi Ali, an author & communications consultant & leafleteer to SNP MSP Angela Constance & SNP PPC Liz Bardell at the last election, to the role of the newly created Judicial Complaints Reviewer, who will review the handling of a complaints investigation into members of the judiciary to ensure that complaints have been dealt with in accordance with the Complaints about the Judiciary (Scotland) Rules 2011, rules which were written by the judiciary itself, waved through by Scottish Ministers & the Scottish Parliament. The Judicial Complaints Reviewer has no powers whatsoever to consider the merits of any complaint or the disposal of the complaint. The appointment will be for a period of three years from 1 September 2011 to 31 August 2014, and will be paid a daily fee of £209. The appointment has been made with the approval of the Lord President. Cabinet Secretary for Justice Kenny MacAskill today announced the appointment of the first Judicial Complaints Reviewer. Moi Ali is an author and Communications Consultant who has written a number of best selling books on public relations and marketing. She spent seven years on the Nursing and Midwifery Council, the world's largest healthcare regulator, where latterly she was Vice President and has also served two terms on the Board of Postwatch. Currently Moi is a member of the Lord Chancellor's review bodies, which investigates complaints about judges and magistrates and a member of the management board of Education Scotland. Moi is a Governor at Edinburgh Napier University and a Public Appointments Ambassador for the Cabinet Office, which involves encouraging a more diverse range of applicants for public appointments. She is also a member of the Scottish Ambulance Service Board with a remuneration of £8,008 per annum. Moi brings a strong background in complaints handling and commitment to improving standards in public life to the post of Judicial Complaints Reviewer. This is a new appointment, established by the Judiciary and Courts (Scotland) Act 2008 to review, when asked, the handling of a complaints investigation into members of the judiciary, to ensure that it has been dealt with in accordance with the Complaints about the Judiciary (Scotland) Rules 2011. The Reviewer has no powers to consider the merits of any complaint or the disposal of the complaint. The appointment will be for a period of three years from 1 September 2011 to 31 August 2014, and will be paid a daily fee of £209. The appointment has been made with the approval of the Lord President. All appointments are made on merit and political activity plays no part in the selection process. However, in accordance with the original Nolan recommendations, there is a requirement for appointees' political activity within the last 5 years (if there is one to be declared) to be made public. Ms Ali has helped to deliver leaflets for SNP MSP Angela Constance in the run up to Scottish elections and SNP PPC Liz Bardell during the last general election. First Minister Salmond ‘delighted’ to welcome controversial ex Lord Advocates onto standards team. TWO highly controversial former Lord Advocates, one, Lord Fraser of Carmyllie, who was arrested at Dundee Airport in 2006 for a breach of Article 78 of the Air Navigation Order 2005, which related to "acting in a disruptive manner" and former Lord Advocate now Dame Elish Angiolini DBE QC, more on whom can be read here have both been appointed by First Minister Alex Salmond as independent advisors to complaints made under the Ministerial code, the body which deals with complaints about the First Minister, which has seen three such complaints dealt with and closed with no action since 2008. Lord Fraser led the inquiry in to the building of the Scottish Parliament, which saw no one held to account for the massive overspend to £500 MILLION on the hapless Holyrood building now in a constant state of disrepair and leaking more water than the Firth of Forth during rainstorms. Earlier in June after an Al Jazera documentary exposed major flaws some may say amount to corruption within the investigation into the bombing of Pan Am Flight 103 over Lockerbie, Scotland in December 1988, Lord Fraser was featured in the documentary telling a film crew he accepted a key witness in the Pan Am 103 trial had been bribed by Scottish Police, yet nothing has been done about it. Lord Fraser also went onto attack the father of one of the victims of the Lockerbie bombing, Dr Jim Swire, accusing him of suffering from ‘Stockholm Syndrome’ with regard to Dr Swire’s campaign to find out the truth behind the Lockerbie bombing. 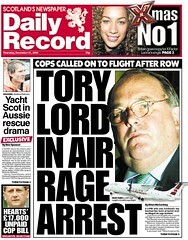 A LORD who was Scotland's top lawman has been arrested over an alleged air rage incident. Lord Fraser of Carmyllie was escorted off a flight by police at Dundee Airport. The Tory peer was Lord Advocate from 1989 to 1992. Witnesses claimed he smelled of drink and argued with a female steward on Tuesday night's delayed ScotAirways flight from London City Airport. A passenger said: "When he got on the later one, he had been hanging around for quite a few hours. He berated a female member of the cabin crew about the delay. He was smelling strongly of drink and requested more drink but was refused. When that happened he became disruptive again and the female crew member became alarmed as did some of the other passengers." Last night, Tayside Police confirmed that a 61-year-old man had been charged and a report sent to the procurator fiscal. It is believed to be the first time that a former Lord Advocate has been charged with a criminal offence. Lord Fraser, born Peter Fraser, was among passengers whose ScotAirways flight was delayed for more than three hours. Fog in London led to it being cancelled and travellers were put on to a later flight. The plane's pilot called ahead for police assistance after a stewardess complained Fraser was being disruptive. Officers were waiting for the flight when it touched down in Dundee at around 9.20pm. Fraser - a former Tory minister - was asked to stay in his seat until other passengers had cleared arrivals. He was arrested and taken to police HQ at Bell Street. The QC was not held overnight. Police refused to give details of the charges against the politician, who was MP for Angus South then Angus East. He was appointed Solicitor General, the No2 job in the prosecution service, under the Thatcher government in 1982. The case was later dropped when the Crown Office said there was “insufficient evidence” to proceed, a now familiar claim from the Crown Office on just about every controversial case it receives. Dame Elish Angiolini joins Lord Fraser in First Minister complaints role. Former Lord Advocates Lord Peter Fraser and Dame Elish Angiolini have agreed to serve as independent advisers to the Scottish Government's Ministerial Code, replacing Lord David Steel and George Reid who have demitted the post. The Scottish Government established a system of independent advisers in 2008 to enable the First Minister to refer complaints made under the Ministerial Code. The former Presiding Officers Lord Steel and George Reid have discharged the role since 2008 - and during this time they considered three complaints against the First Minister, all of which were dismissed.In May George Reid was appointed as Her Majesty's Lord Lieutenant for Clackmannanshire, and Lord Steel indicated that he wished - after a term of three years - to demit the post of independent adviser. First Minister Alex Salmond said : "This administration introduced independent advisers into the Ministerial Code for the very first time, and I wish to record my thanks to Lord Steel and George Reid for their service, and wish them extremely well. "I am also delighted to welcome Dame Elish Angiolini and Lord Peter Fraser as new independent advisers, ensuring the continuation of the robust and transparent procedures that we have within Scotland's system of government." However, First Minister Alex Salmond’s Press Release forgot to reveal that Lord David Steel and George Reid apparently resigned in protest over comments the First Minister had made with regard to the Supreme Court debate surrounding its rulings on the very poor application of Human Rights law by Scottish courts. Regrettably however, the events surrounding the resignation of Lord Steel from the advisory role to the Ministerial code are shrouded in a murky debate as Lord Steel had apparently resigned three weeks ago, in protest over the First Minister’s ‘use of language’ critical of the Supreme Court, yet had agreed to say nothing until the First Minister had found replacements in ‘media critic’ Dame Angiolini & ‘frequent flyer’ Lord Fraser. Weak regulation by Law Society of Scotland & Scottish Legal Complaints Commission to blame for rising theft of client funds. BELL & COMPANY SOLICITORS, a law firm in Kilmarnock which raked in £119,100 of taxpayer funded legal aid for 2009-2010 has been forced to call in the Police after it was revealed in an audit that the firm appears to have lost up to £150,000 of client funds, reports the Sunday Mail newspaper. The fraud has apparently been going on for a matter of months, with money being taken from some client accounts while other clients money was used to cover up the fraud. 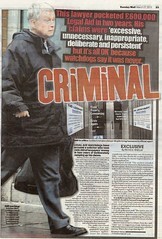 Law Society of Scotland’s Philip Yelland, in charge of weak regulation of crooked Scottish lawyers for over 20 years. Earlier today, legal experts blamed the dismal level of regulation of Scotland’s legal profession which is supposedly regulated by both the Law Society of Scotland and the anti-client Scottish Legal Complaints Commission (SLCC). However, once again, clients of Scottish solicitors are suffering huge financial losses because of poor regulation and poor oversight of both solicitors and their staff who are targeting the myriad of client accounts held by their law firms, accounts which are often poorly policed by the solicitors who control them and the Law Society of Scotland who are supposed to regulate & audit them. 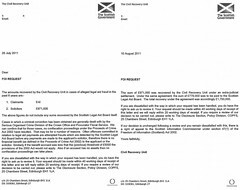 In just one of the cases brought to the attention of Diary of Injustice over the past year, an apparently small but well known law firm in the Scottish Borders was found to have dozens of bank accounts where client funds had been lost on a regular basis and worse still, one of the solicitors in the law firm has, according to information seen by Diary of Injustice, 23 different bank accounts in different banks & different names, some using variations of his own name, others allegedly in his family members name with control signed over to him. In the latest reported case of £150,000 of missing client finds, neither the Law Society of Scotland or the Scottish Legal Complaints Commission have issued any public statement. The Scottish Legal Aid Board (SLAB) was asked for input on this story and whether it was concerned over the revelations a firm on its books has suffered a fraud. As yet no response has been forthcoming from SLAB. The message is clear, the Law Society of Scotland has failed yet again to keep tight financial controls on client funds and an effective regime of enforcement which would prevent client fund accounts being looted in Scotland on a daily basis by solicitors and their office staff. If you as consumers want to protect your own funds & assets, you would be advised to withdraw them from your solicitors control and their law firm, immediately. A LAW firm have called in police after large sums of clients' cash went missing. An audit of accounts at Bell & Company Solicitors found a six-figure sum, which legal sources say could be as high as £150,000, was missing. Now detectives plan to question a female member of staff who has been absent from work since the black hole in the accounts was revealed. The Kilmarnock firm, run by lawyer Susan Bell, contacted the police last month. They have also contacted the Law Society of Scotland about "financial irregularities". Fraud squad officers will investigate claims that legal documents were forged and clients' mortgage and loan repayments falsified over a period of months. Law firms hold money in account for their clients during legal transactions including house purchases. A source said: "This is a serious situation. It will affect clients who had hoped to either use money to buy a house or pay off their existing loans. The cash is no longer there for them. It appears the money was disappearing from the clients' account for a few months and the holes were being plugged but with other clients' cash. It was only matter of time before it was discovered." Ms Bell said last night: "On July 19, I discovered apparent irregularities in my firm's client account. A member of staff, who was not a solicitor, was suspended immediately. Following disciplinary proceedings, her employment was terminated." Policy of non-prosecution : Scotland’s Crown Office failed to go after legal aid fraudsters. THE CROWN OFFICE & PROCURATOR FISCAL SERVICE, Scotland’s £100 MILLION A YEAR prosecution team headed by the Lord Advocate, currently Frank Mulholland QC, is facing questions over its role in walking away from hundreds of fraud prosecutions after it emerged a staggering ONE HUNDRED & SEVENTY SEVEN CASES reported to the Crown Office by the Scottish Legal Aid Board (SLAB) for legal aid irregularities dating back as far as 2005, saw little or no action, and no financial recovery or penalties imposed on lawyers & clients alleged to have defrauded the huge taxpayer funded legal aid budget under the term of now former Lord Advocate Dame Elish Angiolini DBE QC. This latest revelation, which raises significant questions about the determination of the Crown Office to go after lawyers & their clients who seek to defraud Scotland’s £160 MILLION LEGAL AID BUDGET comes after the Sunday Mail newspaper and Diary of Injustice revealed in July the Crown Office had failed to prosecute any of FOURTEEN solicitors who had been investigated by the Scottish Legal Aid Board and reported to the Crown Office for alleged legal aid fraud. 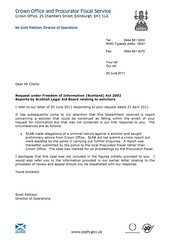 Scottish Legal Aid Board reported lawyers & clients to Crown Office for legal aid fraud, yet no results. 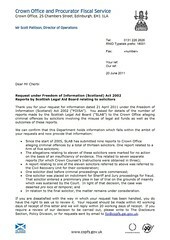 The information revealed by the Scottish Legal Aid Board in response to a Freedom of Information request detailed that on top of multiple cases of alleged legal aid fraud committed by 14 solicitors reported to the Crown Office, a further 177 claimants had been reported to the COPFS for prosecution yet it appears no prosecutions took place in any of the cases even after lengthy investigations had taken place by SLAB at significant cost to taxpayers. The numbers of claimants reported by the Scottish Legal Aid Board to the Crown Office for alleged legal aid fraud revealed in 2005/06, 14 cases were reported for prosecution. In 2006/07 the number increased to 32. In 2007/08 the number increased again to 36. In 2008/09 another increase, resulting in 39 reports. In 2009/10, the number of claimants reported for fraud dipped to 27 and in 2010/2011 numbers increased again to 29. The Scottish Legal Aid Board response went onto state with regard to solicitor only cases : In all solicitor cases, the Board’s initial findings are shared with the COPFS in the first instance. This is to enable the Crown to assess whether, prima facie, a case exists that would warrant further examination, offer direction on the focus of any enquiry and secure the assistance of the relevant police force which will be required to conduct the formal investigation. It is for the Procurator Fiscal to decide if a prosecution should be pursued. 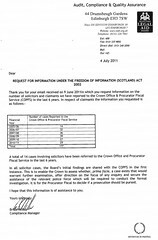 Clearly there is a problem with the Crown Office where no prosecutions or financial recoveries for legal aid fraud have taken place in all the cases reported since 2005, other than in the one single case of a deceased solicitor who was not able to bring the full weight of the legal profession and the Legal Defence Union to his defence. A Scottish Government insider today backed up the results of the investigation by Diary of Injustice into the lack of legal aid fraud prosecutions, claiming Procurator Fiscals had a poor understanding of complex fraud cases and were perceived by many as being reluctant to prosecute cases they felt they would not be able to win. A legal insider speaking to Diary of Injustice on the issue blamed elements of the legal profession for attempting to bully the Scottish Legal Aid Board and the Crown Office over prosecutions of solicitors for legal aid fraud. He also named the Legal Defence Union as a key player in many of the cases involving solicitors “who were clearly on the take”. Legal Defence Union intervened in the case of Niels S Lockhart and brokered deal for no charges or pursuit of complaint. The Legal Defence Union, founded by the Glasgow Bar Association and the Scottish Law Agents Society (SLAS), has itself been linked to secret submissions to the Scottish Legal Aid Board which ensured no prosecution against Niels S Lockhart and 13 other solicitors accused of legal aid irregularities. Diary of Injustice revealed secret submissions from the Legal Defence Union had helped block any further proceedings against solicitor Niels S Lockhart, after an exclusive report in the Sunday Mail newspaper on the Lockhart case. SLCC’s Chair Jane Irvine held secret ‘no records’ meetings in Balmoral Hotel with Legal Defence Union bosses. Further revelations about the relationship between the Legal Defence Union’s relationship with solicitors regulators came to light in an investigation by Diary of Injustice which established a series of SECRET MEETINGS between an LDU Solicitor Director William Macreath, also a partner at law firm Levy McRae and the Chief of the Scottish Legal Complaints Commission (SLCC), Jane Irvine, on off-the-record-no-notes-kept terms at Edinburgh’s expensive Balmoral Hotel, just across from the SLCC’s lavish Stamp Office HQ, where both officials agreed “there would be no formal records of any element of the discussion.”. The Legal Defence Union has also been linked to the suicide of a married Oban family man in the SLCC’s 2009 report into the Master Policy. The Oban suicide case was the subject of at least two reports by the now superseded Scottish Legal Services Ombudsman, who was at the time, Linda Costelloe Baker. Mrs Baker in her reports condemned the Law Society of Scotland’s failures in the case. The current Chair of the Scottish Legal Complaints Commission), Jane Irvine, succeeded Linda Costelloe Baker as SLSO, and is known to be aware of events yet has failed to mention in any public documents the SLSO’s reports on the suicide and the LDU’s involvement in the Oban suicide case. • In relation to the final solicitor, the matter remains under consideration. Crown Office admitted even more lawyers escaped prosecutions over legal aid frauds. A further admission on lawyers referred by the Scottish Legal Aid Board over legal aid irregularities was made from the Crown Office relating to an additional case which had not been initially disclosed to Diary of Injustice. The admission contained details of yet another lawyer accused of allegations of a criminal nature, stating : SLAB made allegations of a criminal nature against a solicitor and sought preliminary advice from Crown Office. SLAB did not submit a crime report but were assisted by the police in carrying out further enquiries. A report was thereafter submitted by the police to the local Procurator Fiscal rather than Crown Office. The case was marked for no proceedings by the Procurator Fiscal. According to the Scottish Law Agents Society website, the Legal Defence Union (LDU) was formed in 1987 for the specific purpose of promoting and protecting the welfare of solicitors in Scotland. Indeed, the concept of an independent defence body for solicitors received unanimous support at the 1987 Annual General Meeting of The Law Society of Scotland. The LDU was the result of a joint initiative by the Scottish Law Agents Society, one of the oldest solicitors’ organisations in Scotland and the Glasgow Bar Association. The Legal Defence Union offers a refuge to solicitors in trouble by providing prompt, expert and wholly confidential professional advice. Assistance is available on a local or national basis and there is no restriction on choice of adviser. It has extensive experience in advising on the problems which may affect solicitors. These include the most serious emergencies of professional life; for example, the threat of contempt of court, police raids on the office, Law Society or Guarantee Fund inspections or a citation to appear before the Discipline Tribunal. The LDU can also help with the many lesser sanctions facing solicitors such as Inadequate Professional Services, problems of conflict, conduct, confidentiality and other risk areas. Financial support to conduct a solicitor’s defence is also provided if required. Members are automatically covered by Legal Expenses insurance for legal representation to defend their rights as solicitors before a professional disciplinary body, Law Society committee, criminal court on a matter of professional conduct, or in certain civil matters. In some instances, membership provides other prosecution defence and employment disputes benefits. General advice can be obtained from any of the solicitors on the LDU board, 13-strong panel of solicitors, which includes the presidents of the Glasgow Bar Association and the Scottish Law Agents Society. Membership is open to all solicitors practising in Scotland. There are 3 categories of membership - CORPORATE, EMPLOYED and INDIVIDUAL.